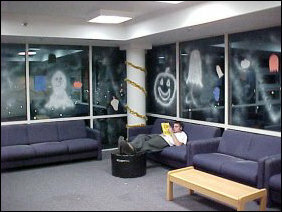 Halloween 2002 was awesome! 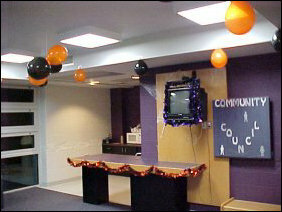 Not only did the residents dress up, but two of the TV lounges were also made festive for the occasion. 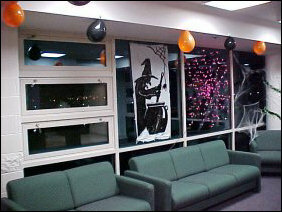 The fourth floor on the freshman side was given a fall holidays theme, with Halloween, Thanksgiving, as well as Christmas represented. 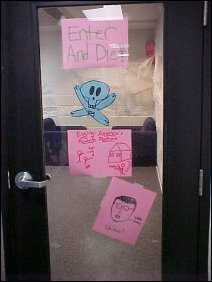 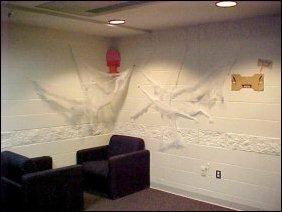 Then the fifth floor on the upperclass side decorated for Halloween. 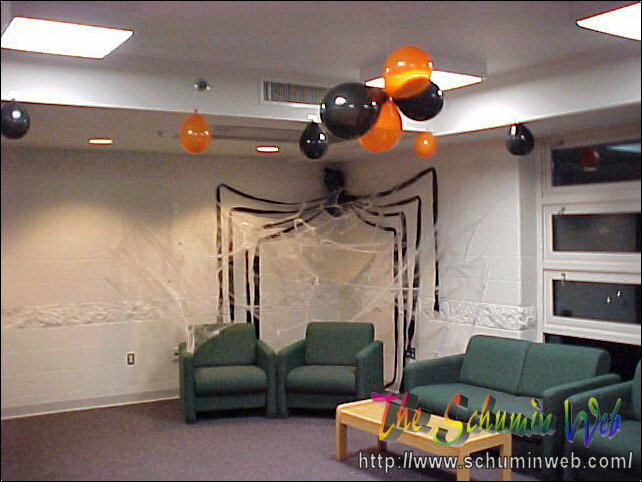 It’s fun… check it out! 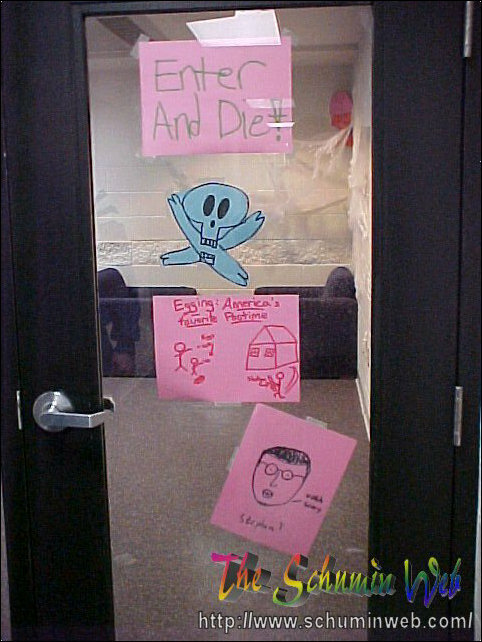 The fourth floor’s decor had a distinctly masculine touch to it, with the “Enter and die” sign, satirized by almost all as “Enter and diet” due to the way the exclamation mark/sword looked. 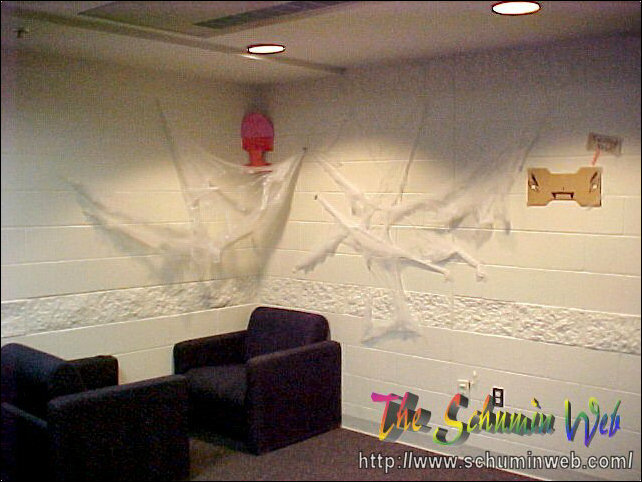 Three sides were Halloween… the one side that was concrete had a spider web on it, and the two glass sides were festively decorated with images made with spray-snow. 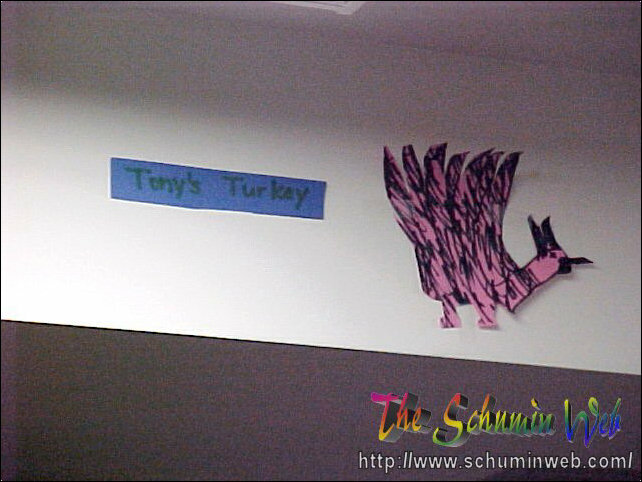 Thanksgiving had a spot near the ceiling, with “Tony’s Turkey”. 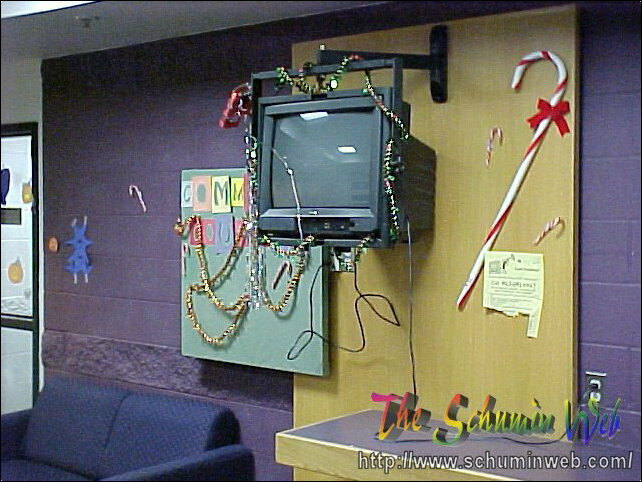 Lastly, the purple wall was decorated for Christmas, with candy canes, Christmas streamers… you name it. About the only thing missing was the tree. 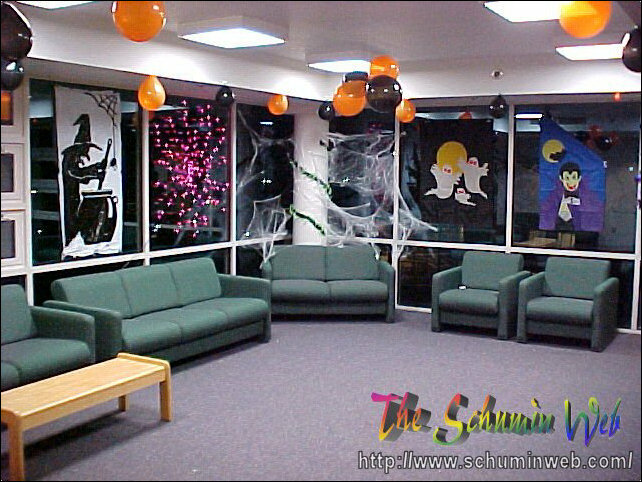 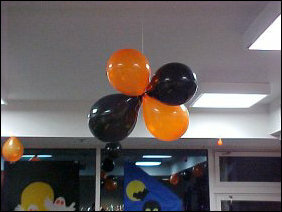 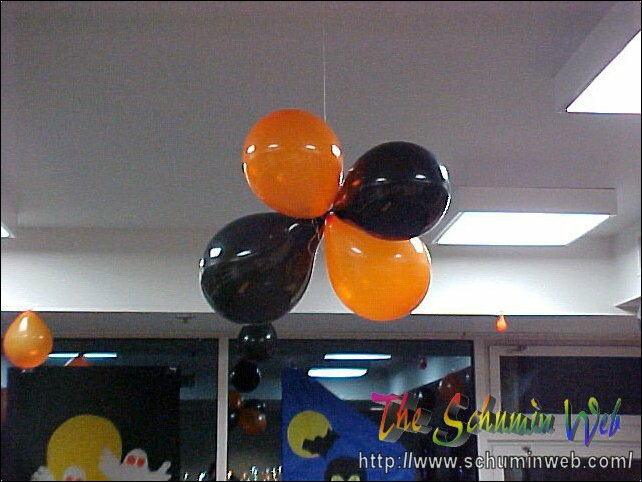 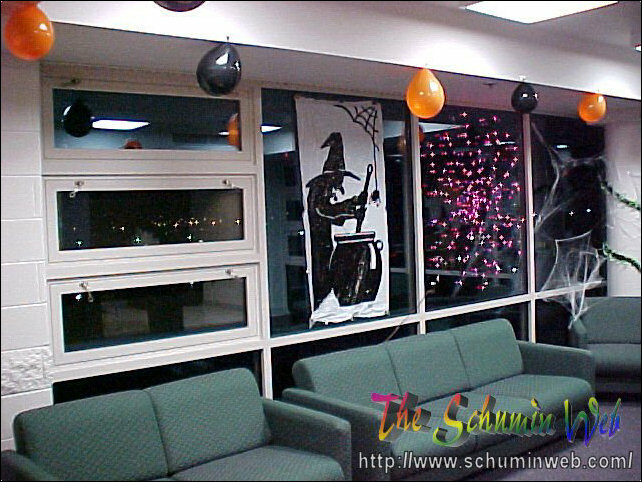 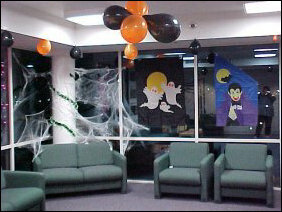 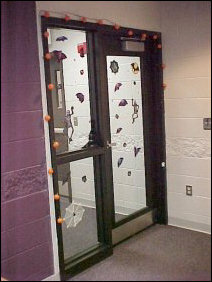 Fifth floor upperclass side had a more feminine touch to it in the decor, and was with one holiday – Halloween. 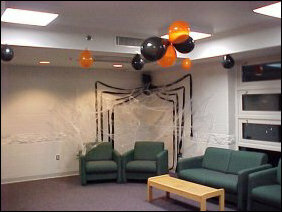 Fifth floor, however, made a big no-no… nothing should be hung from the ceiling in the residence halls. 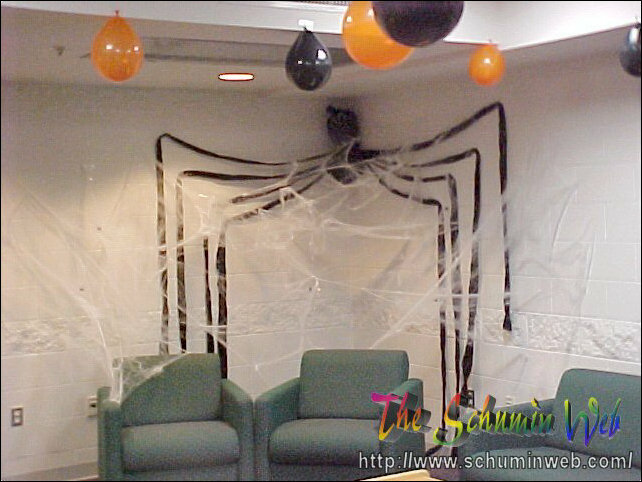 In the corner, we find more spider webs, as well as more balloons and festive decor – flags and stick-ons and such. Continuing around the back side, we find a lighted spider web! And there you have these two sides… great, except for the ceiling decor. 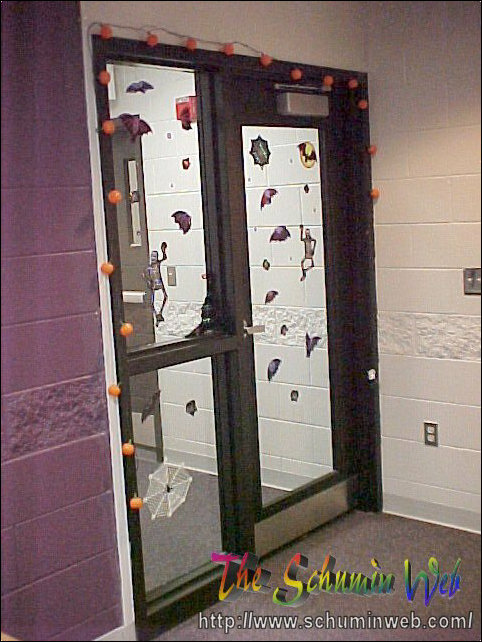 And who can forget the door… decorated with Halloween lights, as well as stickers.